Case Studies - Timber Raft Inc.
An engineering firm was conducting a study at an out-of-town location. They needed to perform manual flow measurements at a stream whenever a significant rainfall event occurred. The stream was located a one-hour drive away. Often, the weather conditions at the office and the study location were different. Despite monitoring local weather forecasts and online weather radar, several months into the study, there had been missed rain events and wasted trips. Timber Raft solved this problem by putting together a custom solution that integrated a microcontroller and cellular modem with the customer's existing tipping bucket rain station located on the roof of a building. We programmed the modem to communicate with Timber Raft's web services so that whenever rain events were detected at the study location, the customer received a text message indicating the intensity of the event. With this system in place, the customer only made the long trip for manual measurements when necessary. Since they never missed any rain events, they were able to complete the study within four more months. Additionally, they were always able to access the rainfall data from their office, via the web, without the need to go out to the roof of the building to collect the data with a laptop computer. They always knew the operational status of the rain station, without going out to check it. A medium-sized municipality required inflow data for redesigning a sanitary sewer pumping station. When significant rain events occurred, the station was overloaded. in two manholes (both on and off roadways) Timber Raft used loggers connected to analog pressure transducers, installed along with flumes, to measure flow. 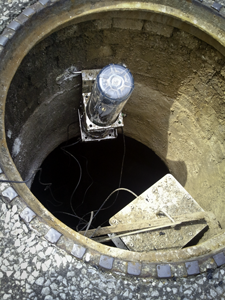 in another manhole, Timber Raft integrated a logger with three serial doppler velocity meters, three analogue pressure transducers for depth and an additional serial data ultrasonic depth sensor to measure total head (a total of seven data channels). All of the loggers were customized with antennas to suit the needs of the location. Every 12 hours, data logs are sent to the TimberRaft.net hosted service, making it available for viewing and download via the web. 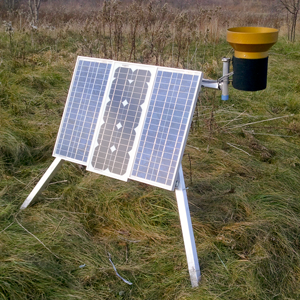 The customer is able to correlate rainfall and flow data from multiple locations. Daily monitoring of this data means that any logging equipment problems can found and addressed quickly, minimizing any downtime or missed data. By using cellular telemetry, Timber Raft was able to provide an effective data collection system for this short-term monitoring program without disrupting existing measurement or control systems at the pumping station.